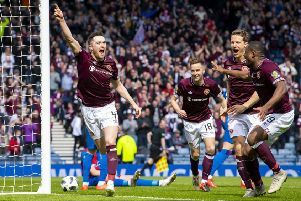 Faith and good fortune helped guide Hearts into another Scottish Cup final. A 3-0 semi-final victory over Inverness Caledonian Thistle at Hampden was prefaced by a silent prayer from man-of-the-match Jake Mulraney and followed by a call from striker Uche Ikpeazu for the Hearts fans to have greater belief in manager Craig Levein. After being frustrated throughout the first half, Hearts broke free in the second. Ikpeazu scored the first goal, and won the penalty converted by Sean Clare for the third. Those strikes bookended a volley by John Souttar that broke Inverness’ spirit and ended their resistance. Levein had faced rising criticism heading into the tie on the back of some indifferent form but Ikpeazu felt next month’s cup final appearance – against either Celtic or Aberdeen, who meet this afternoon – ought to earn the manager some slack. Mulraney found a moment of calm amid the pre-match build-up to say his usual prayer. What followed was one of his best performances in a Hearts shirt. “Surprisingly, I wasn’t really nervous going into the game,” said the winger. “It was weird. I said my prayer and was quite calm before the game. It’s always the same one. I thank God for the opportunity, asking him to protect everyone on the pitch, to keep everyone safe and just to help me. Hearts were worthy winners by the end but enjoyed some good luck, too. With the score still at 1-0, Inverness’ Jamie McCart was denied an equalising goal by the linesman’s flag. Replays showed that it was Mulraney who had actually made the final touch meaning the defender was onside. Souttar’s goal compounded their misery and all but ended Inverness’ chances of reaching the final. The defender expressed his ignorance at speculation linking him with a summer move to Rangers and dedicated the victory to Hearts chairman Ann Budge. “Ann came in at the end and it’s great for her given how much she has done for the club,” said Souttar. Inverness’ disappointment was tempered by the hope that the Hampden experience could yet serve them well in the end-of-season play-offs.